New York City health officials recently announced a recently recognized invasive tick species now found in parts of the United States was for the first time in New York City. The tick, Haemaphysalis longicornis, also known as the longhorned tick, was found in the southern section of Staten Island. The tick is primarily found on livestock and wild animals, and has not been shown to transmit disease in the United States. 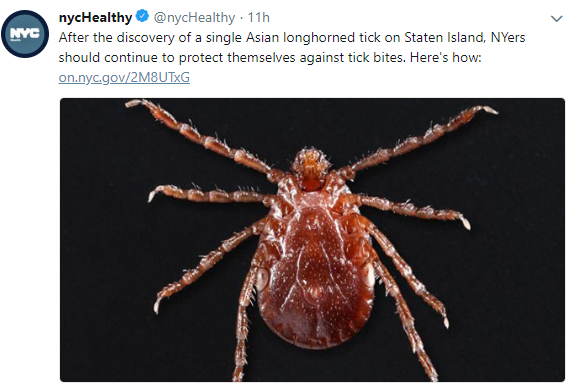 “This new discovery underscores the importance of our recent efforts to control the tick population and educate Staten Islanders about protecting themselves from Lyme disease and other tick-borne illnesses,” said Staten Island Borough President James Oddo. “We will continue to work with the Administration on tick control methods, including our bait box initiative, as well as focus on educating local residents on how to prevent tick bites. The longhorned tick, originally found in eastern Asia, especially China, Korea and Japan, is also typically found in Australia and New Zealand. In these areas the longhorned tick is most notable for its impact on farm animals as it transmits several diseases including bovine theileriosis and babesiosis. In Asia, the tick has been known to spread thrombocytopenia syndrome virus to humans. This is a disease that causes fever, low blood platelet count and a decrease in white blood cells. Human pathogens such as Lyme disease have not been detected in these ticks in the U.S. This year, the Health Department has enhanced its tick surveillance on Staten Island. The agency will conduct tick surveillance in 31 sites: 28 in Staten Island, two in the Bronx and one in Brooklyn. Fifteen pilot sites were surveyed during high tick activity season from May to July: two in Manhattan, four in the Bronx, seven in Queens and two in Brooklyn. Surveillance data will be used to monitor tick densities and their geographic distribution. Ticks collected during surveillance are tested to determine the prevalence of tick-borne diseases. Gal Allergy in colder weather States. Will this Found specimen be tested for Alpha gal Allergn ? The East Asian Longhorned tick is known carrier and vector to transfer this Mammalian or red meat allergn in Japan. This may help explain the sudden dramatic increase in Alpha gal cases especially in colder weather states where livestock and dairy production is prevelant.